I have to admit I squealed with delight when Bustle and Sew released the first three patterns from the new Rosie and Bear pattern set, I think they're incredibly cute! 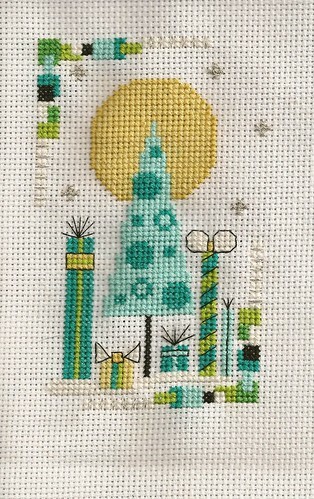 I had been tempted to try a calendar series for a while now and as these patterns look like something I can happily get my teeth into, I'm really looking forward to sitting down and starting to stitch these, once I've got all my Christmas sewing out of the way first of course (ah the demands of this time of year). I think the fur on Bear looks fun to try and I love the extra details like the filled in apples and the optional doily rain clouds. Plus as usual with Bustle and Sew patterns, they come with comprehensive, detailed instructions. 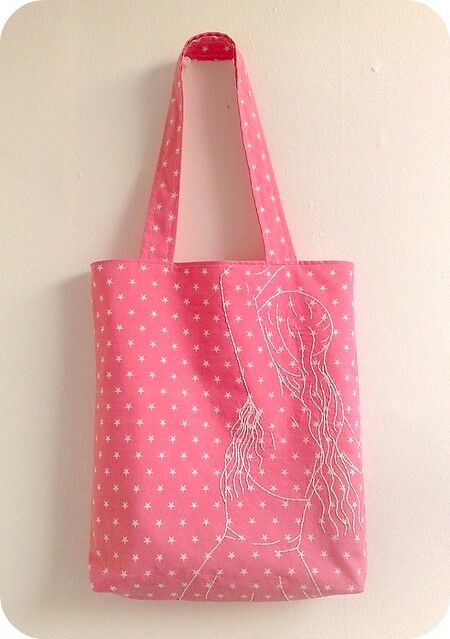 You can purchase the patterns for download here. 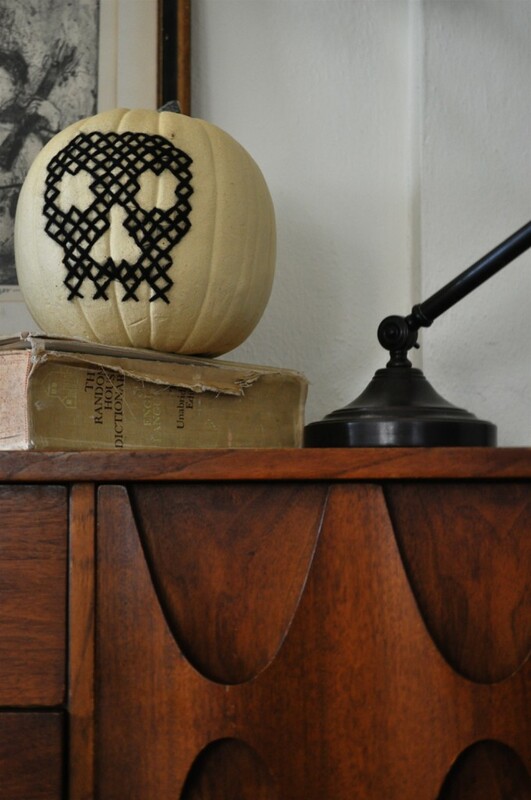 Elsie Marley shows you how to make this wonderful skull pumpkin. 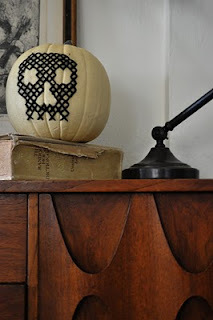 I love the vintage folk art feeling to it. So eerie! 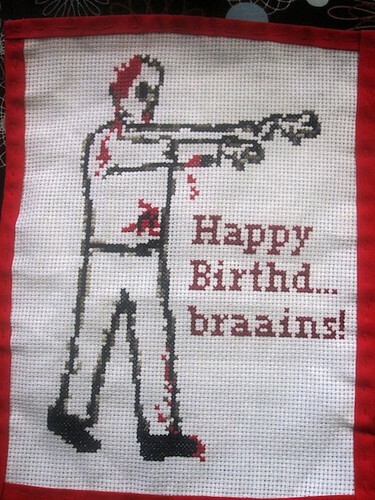 Christmas present cross stitch, originally uploaded by kittykill. 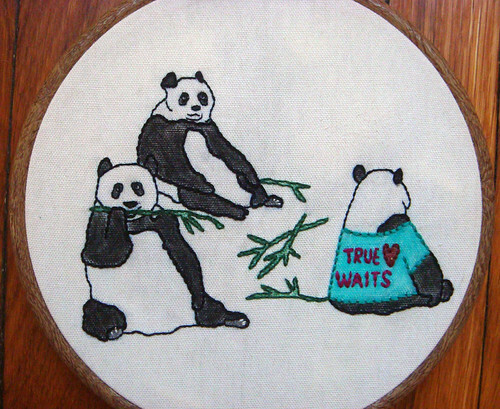 I must admit that normally I am not a huge cross stitch fan. But this is really great! Love the image. Love the colours! 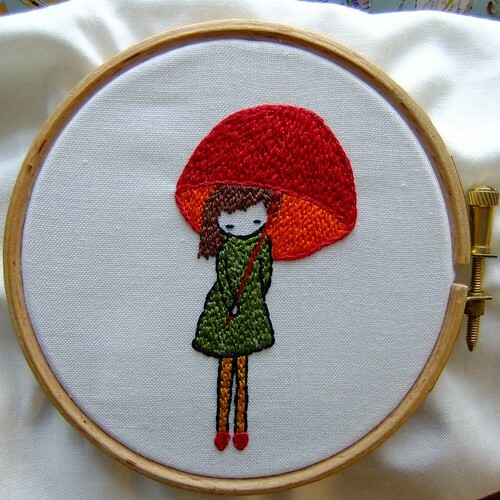 Oh I love anything with a fill stitch and anything with umbrellas and well this is so cute! 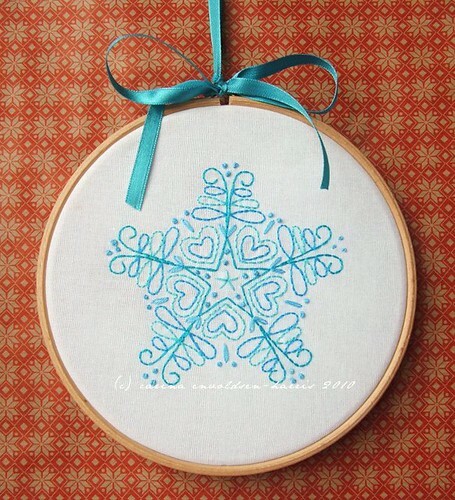 The pattern is Mary Jane by Etsy seller LiliPopo (known as glassmountain on Flickr). Got a list of peeps to craft for this holiday season, but no ideas? 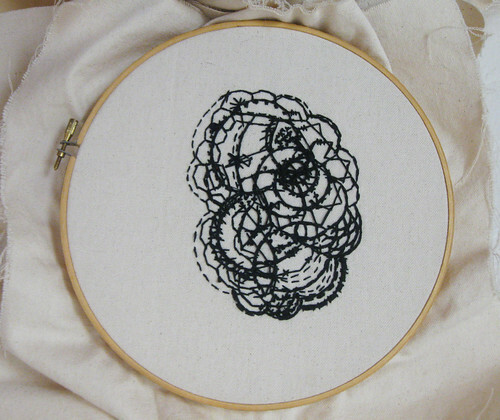 Our very own Carina just let me know about an online embroidery class she'll be doing from October 25 to Nov 21. Ahem, that's 3 days from now! There'll be lessons and projects and patterns, and if I know anything about Carina (which, I think I do) it will all be amazing stuff! To learn more about her class and see some sneak peeks, visit her blog. Or, hop on over to register for the class. 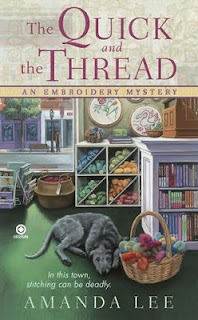 If you're a Feeling Stitchy reader, be sure to enter the coupon code: CHRISTMASFS (so she'll know where you came from). Bravo, Carina - looks like fun! 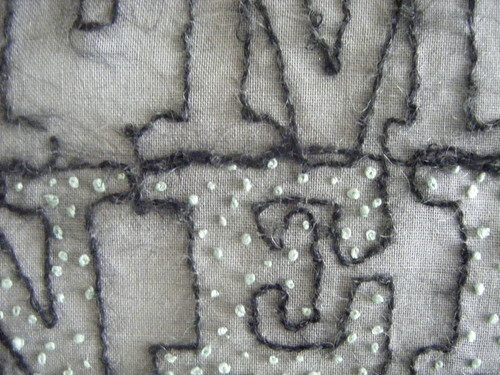 I am in love with the subtle way the white stitching is complemented by the white stars on this fabric. Just, amazing! 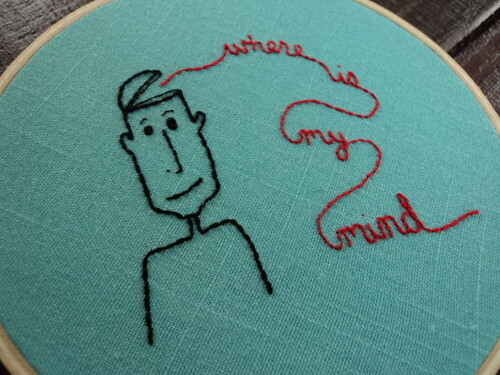 I have already admitted in earlier posts that I have a soft spot for embroidered words. And I love it even more if awesome lyrics are quoted! 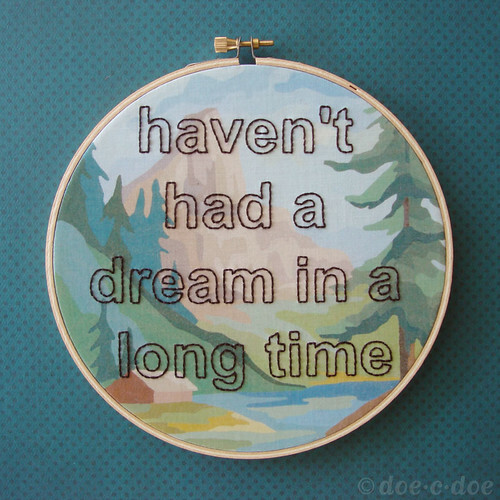 The top embroidery (lyrics from a song by the Smiths) is by Gina (Doe c Doe) and you can even order a custom phrase on that lovely paint by number fabric. 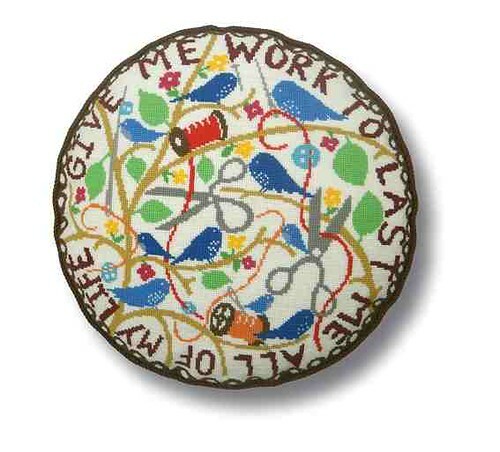 I already have ordered mine, also with words from a lyric. 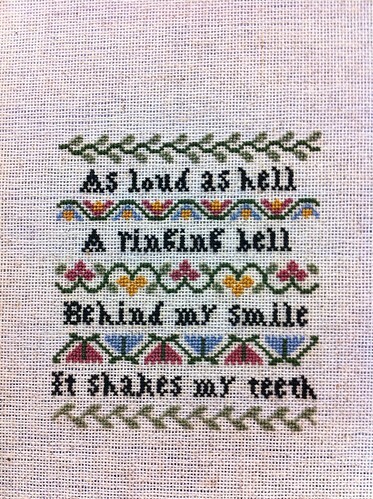 The lovely cross stitch sampler features lyrics from the Pixies and is stitched by Feeling Stitchy's very own Bridget (Beefranck). robot and dog, originally uploaded by daisymae_cs. 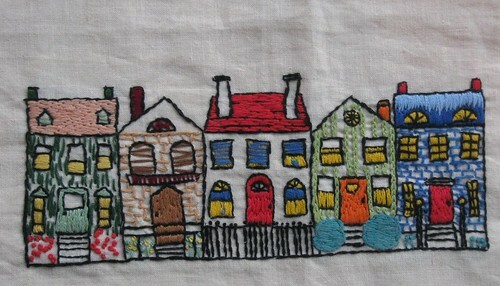 Would you believe it, this is daisymae_cs' first attempt at embroidery! Both the 'bot and dog are super cute! IMG_0682, originally uploaded by pixifave. I love the colour combination of orange and yellow on blue. nervous closeup, originally uploaded by forestine. This is unusual, isn't it? But absolutely fabulous. 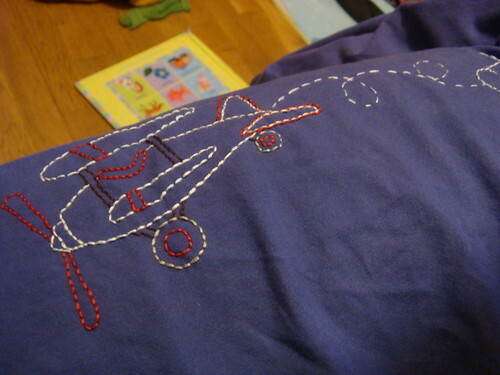 I had great fun recently embroidering my son's previously boring plain blue duvet set with this lovely new set of patterns, Fly High by the relatively new Etsy seller, Motherwifeartist. Fly High includes a great variety of flying machines and some lovely phrases perfect for bedtime sets. 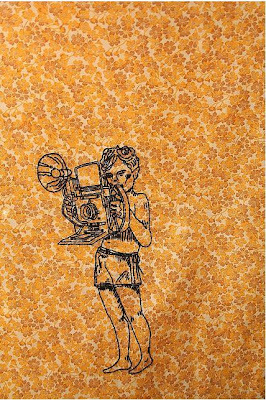 pixies inspired, originally uploaded by cappywanna. I love this pattern (which is part of Sew Lovely's Smile for the Camera pattern sheet) and I love the choice of fabric and the use of just black thread and how the boy has been placed in the bottom corner of the piece. 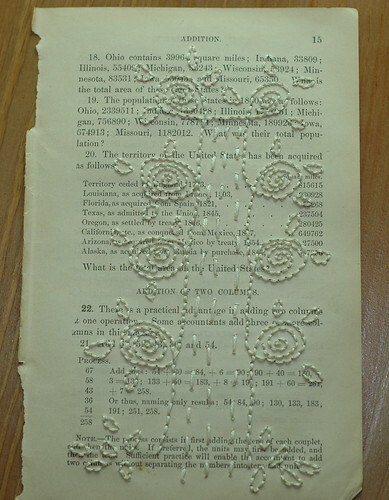 A beautiful pattern and a beautiful piece of work to. 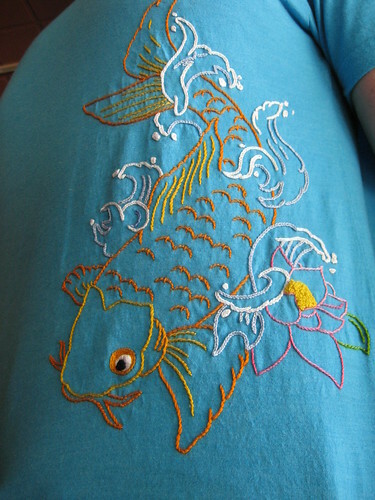 When you regularly browse the photos posted in the Embroidery group on Flickr you must have come across some of these detail photos of embroidery stitches by Kim. Kim is stitching a hundred different stitches from a book called... One Hundred Embroidery Stitches and this Chained Feather Stitch, which looks rather lovely, is number 31. 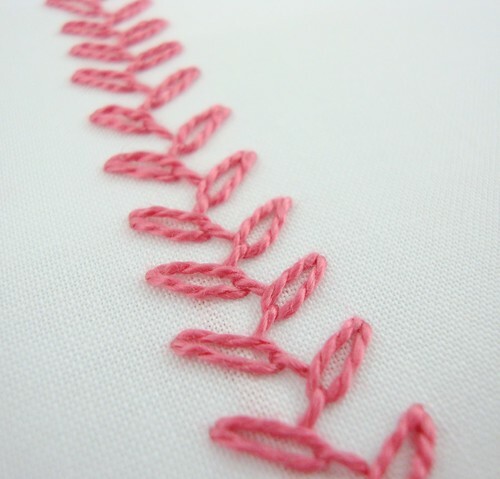 Kim has lots of pictures on her blog on how to do these stitches so it's well worth a visit!